How do I get my child to stop eating toothpaste? Eating strawberry-flavoured anything can be rather tempting, but swallowing large amounts of toothpaste, particularly with high levels of fluoride, can make your children very sick. Here are a few tips to help them fight the temptation and practise good tooth brushing for healthy, sparkly teeth. Tooth decay is a major condition and, as Nicholas Kassebaum et al writes, possibly the most prevalent one in the world among children. It can cause pain, infection, eating problems, sleep loss and even time off school if children do not take care of their teeth. But that’s easier said than done, particularly if our little ones would rather nibble on their toothbrushes and indulge in the delicious bubble gum-flavoured toothpaste, rather than brush, rinse and spit it back out again. So how do we get our little ones to brush their teeth without using their toothpaste as an early morning and bedtime snack? And is it even safe for them to be swallowing all that toothpaste? Nicola explains that toothpaste for yourself and toothpaste for your little one are two completely different things because the amount of fluoride in regular toothpaste might be too much for your child. Expressed as parts per million of fluoride (ppmF), children under 3 years old should use a toothpaste with 1,000ppmF, while adults should use 1,450ppmF. 2. Consuming (as in eating) large amounts of fluoride can cause stomach problems or, in even larger doses, serious intestinal blockage. That being said, if you unintentionally swallowed a little bit of toothpaste this morning or used it to freshen up before your meeting, you’ll be just fine. Dr Androëtta Bekker, a Houtbay pediatric dentist reassures, "Baby toothpaste has less fluoride than adult toothpaste, specifically because kids tend to eat it. But it's not a good idea to make a habit of it. And don't eat the whole tube." So how do I get my little one to stop eating toothpaste? You can use a children’s toothpaste that doesn’t necessarily come in yummy flavours or any flavours at all. Some kiddie-friendly toothpaste, including natural and organic ones, have minty and other tastes that may not be appealing enough to want to swallow. Assist and watch them when they’re brushing their teeth, so that you’re the one that applies the amount of toothpaste needed, while also keeping the toothpaste away from them, possibly in a locked cabinet. This way, you’re only giving them a little bit at a time and they won’t be able to undo the top and squeeze any more toothpaste into their mouths like it’s an actual tube of strawberry gold. When monitoring them, make sure they rinse and spit the toothpaste out between brushes. While we know this is actually the problem, keeping a glass of water by the sink and making a bit of a gargling game out of it might encourage them to spit. It will also be somewhat of a reflex to spit then – an added bonus, if you will. Doing so a few times will reinforce the idea that toothpaste shouldn’t be eaten but should only be used to clean our teeth. At such a young age, children need to not only be told how to do things, but sometimes shown as well. So it might be a good idea to stand alongside them and brush your teeth as well. Encourage them to imitate you, while you make an effort to brush correctly, for the right amount of time, while spitting in between. Make it a game of copy-cat. And if you amusingly stick out your tongue and give it a brush too (as you should), they’re guaranteed to follow suit. You can also show them how to brush their teeth and why it’s important by playing them a little song or having their favourite character act it out. Wheels24's Janine Van der Post says, "I have a three-year-old daughter who used to brush her teeth religiously since before she was one years old. Then it came to an abrupt halt a few months ago and it has been an emotional battle to get her to do what she needs to. She only very recently discovered Doc McStuffins. Bless that little toy doctor’s soul. Ever since my daughter watched the episode of the Doc helping out Bronty the dinosaur’s smelly breath problem, and sang the catchy tune about the importance of brushing your teeth and 'having a party in your mouth', we haven't had problems again." Janine continues, "She’s back to willingly brushing her teeth every day and is so chuffed when you tell her how sparkly her teeth are." 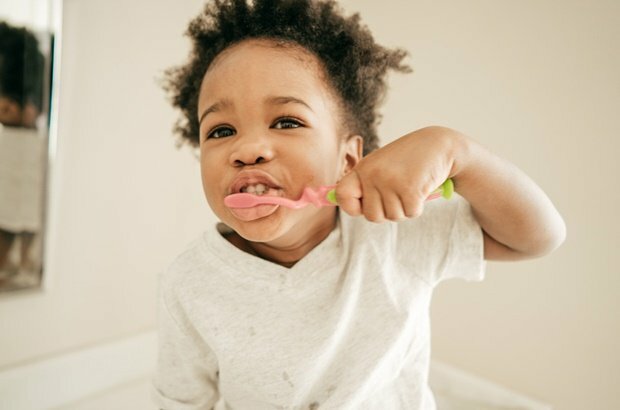 How did you get your little one to start brushing their teeth without eating their toothpaste? Tell us by commenting below or emailing chatback@parent24.com and we may publish your comments.